When I was doing something on my laptop, all of the sudden I found a very nice article that I would like to share with you. It’s about how to be a good hotelier and what makes a person becomes successful in Hospitality Industry besides all the passion and willingness to strive in the Hospitality Industry. So here it goes – I hope you will get something out of this topic. He must have the facility to entertain Prime Ministers, princes of industry, pickpockets, gamblers, bookmakers, pirates, philanthropists, popsies, and prudes. He should be, or have been, a footballer, golfer, bowler, tennis player, cricketer, darts player, sailor, pigeon fancier, motor racer and linguist, as well as have good knowledge of any other sport involving dice, cards, horse racing and billiards. He must always look immaculate, when drinking with the ladies and gentlemen mentioned in the second paragraph, as well as bankers, swankers, theatricals, commercial travellers and company representatives – even though he has just made peace between any of the two, four, six or more of the aforementioned patrons. To be successful, an hotelier must keep the bar full, the house full, the store rooms full, the wine cellar full, the customers full, and not get full himself. He must have staff who are clean, honest, quick workers, quick thinkers, non-drinkers, mathematicians, technicians, and at all times on the boss’s side, the customer’s side, and stay on the outside of the bar. To sum up: An hotelier must be outside, inside, offside, glorified, sanctified, crucified, stupefied, cross-eyed – and if he is not a strong, silent type, there is always suicide. What Makes a Successful Hotelier? You need to be a people’s person. This doesn’t mean just being pleasant and smiling at people. It means you have to love being around people. Your job isn’t just about cleaning rooms and comfortable beds, it’s about pleasing people. Most can tell when you’re simply being polite because it’s expected as opposed to when your actions stem from a willingness to please. It’s more than just a “have a nice day” attitude. It’s more of a “how can I help you have a great day?” attitude. You need to be a jack-¬‐of-¬‐all-¬‐trades. There is no task in running a hotel that is not in your job description. From working behind the bar, to helping make beds, the successful hotelier can do it all and does it all, willingly. Needless to say, you have to have an extremely strong work ethic. The hotel industry demands hard work and long hours. The guests are there for a holiday; you’re there to work. You need to be direct, assertive and decisive. This applies to staff and guests alike. You need to communicate clearly with your staff – they should know their responsibilities and tasks and there should be no room for doubt. When it comes to guests, decisiveness is reassuring. It lets them feel that you’ve understood their complaint or request and you’re going to do something positive to ensure that it’s resolved. Decisiveness extends to remaining calm in a crisis – it’s easy to be good at your job when it’s all smooth-¬‐sailing, but add a crisis to the mix and you’ll really find yourself tested. Keep a clear head and formulate a plan of action. You need to be approachable. Your staff should feel like they can come to you for anything – that your door is always open to them. Your guests need to feel the same. A good leader is one who is approachable and who listens. You need to be passionate. It’s hard work being a successful hotelier. Passion will help you put enthusiasm into the job even if you’re tired and stressed. Passion motivates other people, too – if your passion is genuine, your team will find it contagious and it will improve their outlook and performance. You need to be observant. You need to see things others don’t – from reading body language, to noticing a crooked picture on the wall – take it all in and see where something is lacking and where something else can be improved. You need to be able to discern weak links in your team and identify where and how people work well together and how you can help them improve their skills and service. Being observant also helps you to pre-¬‐empts your guests’ needs, and if you can tell them what they need before they’ve realized they need it – bonus points to you. An eye for detail and perfectionism is also necessary here. Most importantly: you need to focus on success. Focus is what directs the hotelier towards those activities which matter most. 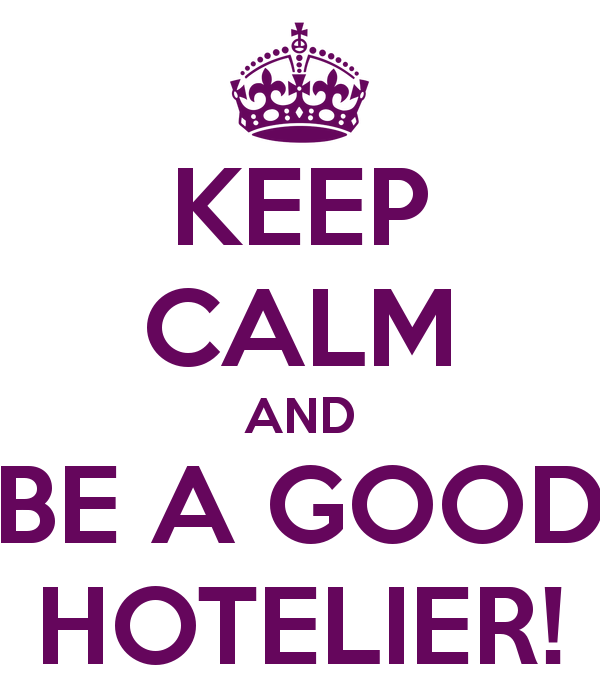 The best hotelier realizes that just being busy is not as important as being busy doing the right things.